The registration for the competition is closed and we are very happy to announce that 421 choreographers from 44 countries all over the world registered a total of 304 different choreographies for the Rotterdam International Duet Choreography Competition. From these registrations, the pre-jury will select 16 choreographies for the competition and we will announce it on 15 April 2019. RIDCC is the first and only international dance competition that focuses exclusively on duets. The competition gives choreographic talent the opportunity to present itself for a renowned jury. There are several awards to be won, including an audience award and the possibility to make productions at one of the participating partner companies. 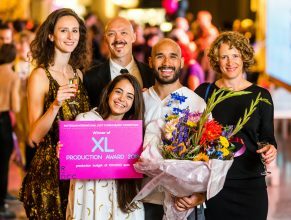 The XL Production Award of € 100,000 is the largest dance prize of its kind in the world. Who will be this years winner? The event will take place from 27-29 June 2019 at Theater Rotterdam. Get your tickets now.